Crosshole Sonic Logging (CSL) has come into widespread use for quality assurance of the concrete placement in concrete drilled shaft foundations, particularly when they are drilled using wet-hole drilling methods due to the risk of concrete contamination. The CSL method is used to measure the speed of sound between water-filled cast-in-place access tubes. The velocity of the sound wave which travels from source to receiver in a horizontal plane determines the presence of anomalous regions (due to water or air-filled voids or soil intrusions) and therefore the quality of the concrete. When plotted against depth, a CSL velocity log quickly defines the depth and approximate lateral location of a potential defect. For added higher resolution of shaft integrity and defects, the Crosshole Tomographic (CT) velocity imaging method is used. The CT velocity method accurately and precisely defines the size, shape, severity, depth, and location of potential defects by determining the spatial velocity distribution of shaft concrete through analysis of numerous soundwave raypaths. Although the CT process is currently slower than CSL, its two-dimensional (2D) and three-dimensional (3D) imaging results go unmatched for engineering accuracy, interpretation simplicity, and visual appeal. CSL and CT results are presented for sound and defective drilled shafts tested in research projects and real-world consulting. The methods have been successfully applied in both arenas to locate unknown and pre-existing test defects. Meaningful and valid CSL and CT data analyses and interpretation require sufficient knowledge in the history of the concrete placement, local site parameters, material properties of concrete, and the physics of the test. The CSL method has been recently standardized by the American Society of Testing and Materials (ASTM) and is described in Standard No. D 6760. When used by an experienced professional, the CSL and CT methods are an excellent tool for determining shaft integrity and finding potential areas of concern. Further, they eliminate the questions and concerns associated with a problematic concrete pour. New concrete shaft foundations are often poured in wet holes in which at least a portion of the shaft is below the groundwater level. The methods used for properly placing concrete in a wet hole pose a risk of concrete contamination from adjacent soil intrusion or collapse and risk of concrete weakening by accidental increase of the water-to-cement ratio. Non-destructive Evaluation (NDE) is typically performed to quickly and accurately locate and assess possible shaft foundation defects and to describe their size, shape, and severity. 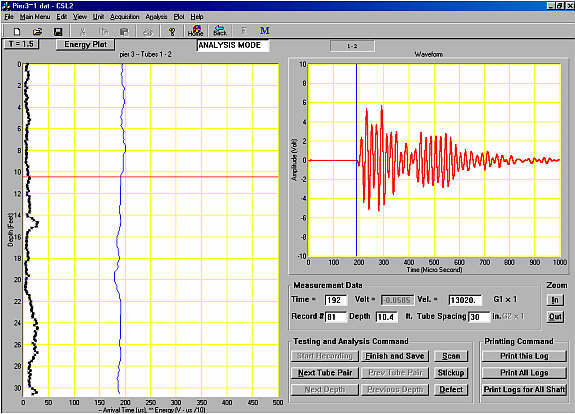 Acoustic methods are the most widely used techniques for testing foundations for defects; the most common method for large shafts is Crosshole Sonic Logging (CSL). Both CSL and CT have high spatial resolution and have proven to be accurate in research and construction cases. Descriptions of the test methods, example results, and case histories for both research projects and real-world consulting arenas are given below. Crosshole Sonic Logging (CSL) is the quickest of the two acoustic logging test methods and provides an initial assessment of the integrity of the foundation. With the CSL test, defect height, depth location, and approximate lateral location can be determined. In the case that no defects are found using CSL, Crosshole Tomography (CT) is rarely performed because little additional information can be obtained. The CSL method is described and example data are given below. Fig 1: Crosshole Sonic Logging (CSL) test method. The CSL test is a downhole method for quality assurance testing of drilled shaft foundations and concrete slurry walls. Access tubes, typically PVC or steel, must be cast-in-place in the concrete during construction or coreholes must be cut to permit logging as illustrated in Fig. 1. For a CSL test, logging involves passing an ultrasonic pulse through the concrete between source and receiver probes, which are located at the same depth in water-filled tube pair or hole pair as the probe cables are pulled back to the surface over a depth measurement wheel. The CSL method thus tests the quality of the concrete lying between a tested pair of tubes. Analyses to evaluate the integrity of the concrete include measurement of wave travel times between the source and receiver, calculation of corresponding wave velocities, and measuring receiver response energies. Longer travel times and corresponding slower velocities are indicative of irregularities in the concrete between the tubes, provided good bonding is present between the tubes and concrete. The complete loss of signal is indicative of a significant defect in the concrete between one or more tube pair combinations. The CSL test method has been recently standardized in American Society of Testing and Materials (ASTM) Standard No. D 6760. Additional details on the CSL method are discussed by Hollema and Olson in "Crosshole Sonic Logging and Tomographic Velocity Imaging of a New Drilled Shaft Bridge Foundation" . Initial compressional wave (P wave) arrival times are automatically picked by the CSL software program or manually picked by the user. The arrival times are then plotted versus depth to produce a CSL log like that shown in Fig. 2 in what is known as a FAT plot (First Arrival Time). Fig. 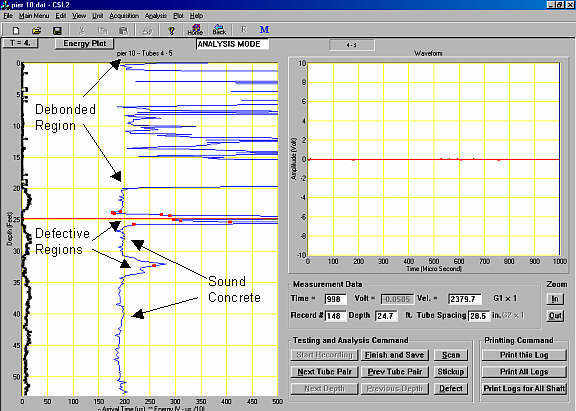 2 shows the CSL log and a single time domain signal for a sound (no anomalies), 32 ft long, concrete shaft. First arrival times are plotted in blue (light line) and receiver output energy is plotted in black asterisks. Fig 2: CSL log for a SOUND shaft foundation (left) showing the first arrival time (blue) and energy plots (black asterisks). A single recorded time domain signal is shown in red (right) for the red cursor depth position in the log. Fig 3: CSL log for a DEFECTIVE shaft foundation (left) showing the first arrival time (blue) and energy plots (black asterisks). A single recorded time domain signal is shown in red (right) for the red cursor depth position on the log. where D is equal to the measured tube spacing at the surface in inches and tp equals the first arrival of the compressional wave energy (P wave). 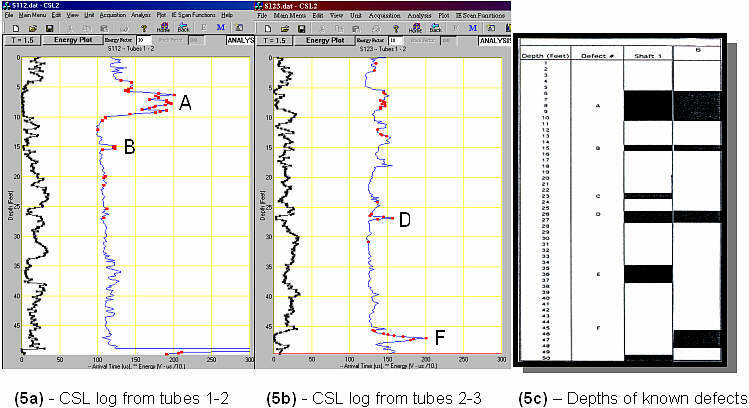 Figure 3 shows the CSL log for a defective concrete shaft foundation, approximately 54 ft long. The area labeled "Debonded Region" indicates where the PVC access tubes were debonded from the concrete. Debonding conditions between tubes and concrete can sometimes occur in a shaft. Tube debonding conditions can be due to various causes. The most common cause of tube debonding is initial tube expansion during the curing process due to heat from concrete hydration followed by contraction of the tube as the concrete cools. No shaft integrity information can be obtained from the CSL logs in debonded regions and different NDE methods must be pursued. 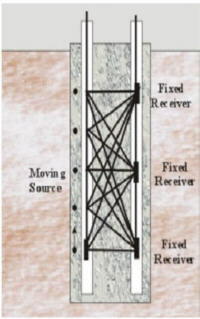 Two defects, upper and lower, are shown deeper in the shaft at approximate depths of 23 - 27 ft and 31 - 34 ft, respectively. These defects were initially reported as anomalies because the signatures of both the FAT and energy plots deviate from the normal trend of the shaft, but without coring it is uncertain whether the anomaly is a defect or due to other causes (debonding for example). The waveform on the right corresponds to the depth of 24.7 ft indicated by the cursor on the log in the middle of the upper defect. Notice there is relatively no signal recorded compared to that in Fig. 2 for the sound shaft. This shaft was cored and both defects that were discovered with the CSL testing were encountered. The upper, more severe defect was found to be a void and the lower defect was found to be due to soil ntrusion. Crosshole Tomography (CT) is an imaging method analogous to CAT-scanning in the medical industry and uses acoustic waves. CT testing is often performed after the CSL testing has been performed to obtain more information about the size, shape, location, and severity of a suspected defect in a shaft. CT data collection is intense and the procedure is relatively slow compared with CSL. The spatial resolution of CT is much higher than that of CSL and an actual image of the shaft is produced. A description of the CT test method is given below. Fig 4: Crosshole Tomography (CT) test schematic for concrete foundation quality assurance. The CT method uses the same equipment and access tubes as the CSL method. For CT testing, acoustic data are collected for many receiver and source combinations at different depths (Fig. 4) whereas CSL testing is for source and receiver positions at the same depth or horizontal plane. For a typical CT data set, thousands of raypaths are generated for hundreds or thousands of source-receiver location combinations. For CT testing, the receiver is fixed at a given depth and the source is pulled from the tomogram bottom extent to top and generates sound wave energy at 0.2 ft vertical intervals. The source is typically pulled from shaft bottom to top to ensure proper ray coverage (at least ± 45o from horizontal) and to simplify field testing procedures. 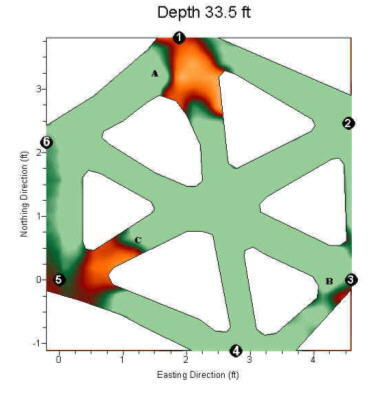 Crosshole Tomography is an analytical technique which uses an inversion procedure on the first arrival time data of compressional or shear wave energy that can produce ultrasonic pulse-velocity based images of a 2D or 3D concrete zone inside a foundation or the entire foundation. With the SIRT (Simultaneous Iterative Reconstruction Technique) inversion routine, the test region is first discretized into many cells with assumed slowness values (inverse of velocity) and then the time arrivals along the test paths are calculated . The calculated times are compared to the measured travel times and the errors are redistributed along the individual cells using mathematical models. This process is continued until the measured travel times match the assumed travel times within a user-specified tolerance. The end result is a 2D or 3D image (contour) of the internal structure of the foundation, revealing sound versus defective areas. Fig 5: CSL anomalies compared with known defects. A Crosshole Sonic Logging (CSL) and Crosshole Tomography (CT) investigation was performed at the University of Massachusetts, Amherst, in April of 2000, as part of a competitive program to nondestructively image known foundation defects for 6 drilled shafts. The program was sponsored by the Geo-Institute of the American Society of Civil Engineers (ASCE). CSL and CT test results are presented here for Shaft 1. Figures 5a and 5b show the CSL results for tube pairs 1-2 and 1-3, respectively. Figure 5c shows the depths of the known defects in the 3rd column and the anomalies that were evident in our CSL, CT, and Sonic Echo/Impulse Response (SE/IR) data in the 4th column. The SE/IR test is a sonic surface reflection test that will not be discussed herein. Defects A and B were discovered in the CSL data from tube pair 1-2. Defects D and F were discovered in the CSL data from tube pair 2-3. The depth position of discovered defect F was somewhat shifted due to limitations of the CSL test at the bottom portions of the shaft. Neither defects C nor E were discovered because they were relatively small and positioned outside of the rebar cage; CSL is typically sensitive only to defects within the rebar cage. Fig 6: CT Tomogram of 2D data set collected between tubes 1-2 at Amherst. 2D Tomography data were collected for all tube pairs. A sample tomogram for tube pair 1-2 quantifying Defect A (between -7 and -11 ft) is presented in Fig. 6. The 2 ft difference in depth between the anomaly shown in 2D tomogram and the true defect is due to the 2 ft remaining access tube stick-up which was not corrected for in the tomogram. 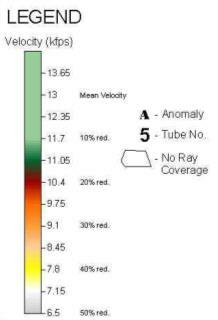 The absolute velocity scale shows color assignments and was designed to most clearly show the anomaly. The defect is successfully imaged and is characterized by velocities dropping to nearly 8,000 fps, indicating its severity. This defect was a combined 12 inch diameter plastic bucket and fiberglass insulation. 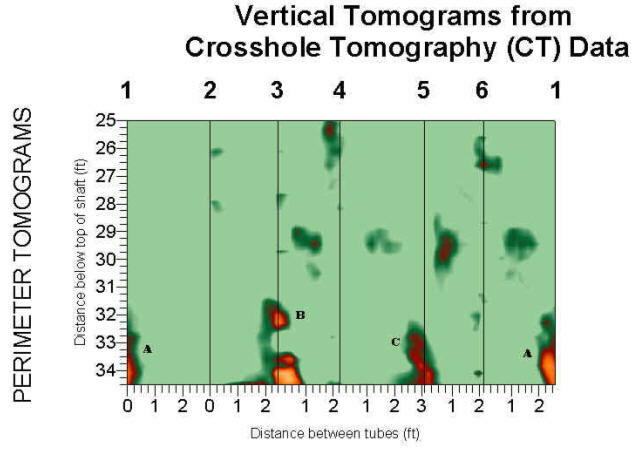 Crosshole Tomography (CT) testing was performed on 6 drilled shaft foundations in July of 2002. The shafts tested were foundations for a future highway overpass bridge. The CT testing was performed to image the size, shape, and exact location of possible defects discovered during previous Crosshole Sonic Logging (CSL) testing by another firm and to determine the severity of the anomalies. Limited CSL testing was performed prior to CT testing by Olson Engineering to confirm the anomalies previously discovered. The CSL and CT results for 1 tested foundation, Pier 2, are presented and discussed below. 3D CT was performed on Pier 2. 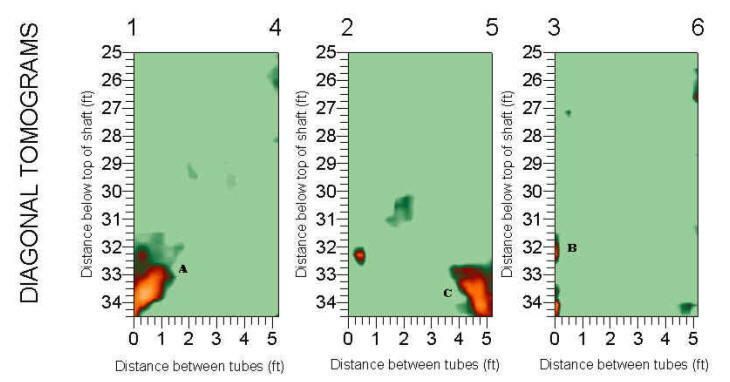 CT data were collected in 9 tube pairs (panels), 1-2, 2-3, 3-4, 4-5, 5-6, 6-1, 1-4, 2-5, and 3-6, from approximate depths of 34.5 ft (shaft bottom) to 25.0 ft. This survey was designed to image anomalies discovered with the CSL method in all tube pairs near the shaft bottom. Receiver vertical increments were 0.5 ft and source energy was generated at 0.2 ft vertical increments. The 3D data set was iteratively inverted for velocities with a 3D SIRT routine. Fig. 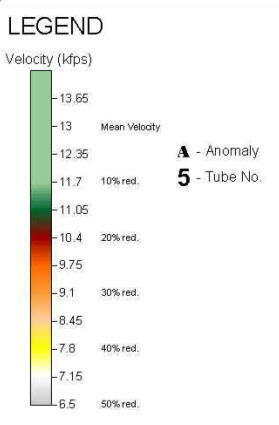 7 presents the CSL results for tube pair 3-4, revealing a soft bottom anomaly. A similar anomaly is evident in the CSL data for tube pair 4-5 presented in Fig. 8. This type of anomaly is often found with the CSL method in wet-hole placed foundations. From the CSL results, it is not possible to pin-point the exact size or location of the 2 anomalies. We can tell that 1 anomaly is occupying a portion of the travel path between tubes 3 and 4 and another occupies a portion of the travel path between tubes 4 and 5. CT analysis is necessary to obtain size and location information. Fig 7: CSL results for tube pair 3-4. Fig 8: CSL results for tube pair 4-5. The 3D velocity tomography results are presented in the form of tomogram compilations in Figs. 9 and 10 below. Fig. 9 shows a compilation of vertical tomograms. The perimeter tomograms are organized in an "orange peel" arrangement, as if the shaft were sliced along tube 1 and peeled open laterally. Additional diagonal tomograms (across shaft center) are shown in Fig. 9 as well. The legend at the figure bottom explains the color assignments. Shaft voxels with less than a 10% velocity reduction from the mean foundation velocity (11.7 kilofeet per second, kfps) are plotted in light green and voxels with velocity reductions greater than or equal to 10% of the mean foundation velocity are shown in varying shades of green, orange, yellow, and white. Three anomalies with major velocity reductions are visible in both the perimeter and diagonal compilations, near tubes 1, 3, and 5, labeled A, B, and C, respectively. Fig. 10 shows a horizontal slice through the shaft at a depth 33.5 ft. The color assignments are the same as those of Fig. 9. Anomalies A, B, and C are clearly evident in the horizontal slice format as well. The 3D tomographic results in Figs. 9 and 10 accurately quantify the size, shape, severity, depth, and location of shaft defects. Fig 10: Horizontal tomogram compilation of 3D CT data for Pier 2. 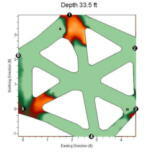 The use of Crosshole Sonic Logging (CSL) to identify concrete defects in drilled shafts for wet holes has become a proven QA method for most DOT's in the U.S. Now, 2D and 3D Crosshole Tomograms (CT) are practical and powerful for use in imaging CSL anomalies to characterize the size, shape, extent, and severity of potential defects. The CSL and CT methods have proven to give accurate and reliable results when performed to locate known defects in the research arena. The high level of proven confidence in these imaging methods are extended to the shaft contractor and/or design engineer for reliable QA of foundations in the real-world arena. Hollema, D. A., Olson, L. D., "Crosshole Sonic Logging and Tomography Velocity Imaging of a New Drilled Shaft Bridge Foundation", The American Society for Nondestructive Testing, Inc., Structural Materials Technology V Conference, presented at Cincinatti, Ohio, September 10-13, 2002. Herman, G.T., Image Reconstruction from Projections, the Fundamentals of Computerized Tomography, Academic Press, Inc. 1980.